To make the sweet shortcrust pastry, place the flour, sugar and butter in a food processor and process until the mixture resembles fine breadcrumbs. With the motor running, add the egg yolks and water and process until a dough just comes together. Turn out and bring the dough together to form a ball. Roll out the dough between 2 sheets of non-stick baking paper to 4mm thick. Refrigerate the pastry for 1 hour. Preheat oven to 160°C (325°F). Line a 22cm loose-based fluted tart tin with the pastry. Trim the edges and prick the base with a fork. Refrigerate for 30 minutes. Line the pastry case with non-stick baking paper and fill with baking weights or uncooked rice. Bake for 10–12 minutes, remove the paper and weights and bake for a further 12–15 minutes or until the pastry is light golden. Allow to cool slightly in the tin. Place the eggs and sugar in a food processor and process for 5 minutes or until pale. Add the flour and desiccated coconut and process to combine. Place the butter in a small non-stick frying pan over medium heat and stir until melted. Cook for a further 1–2 minutes or until golden brown with a nutty fragrance. With the processor running, add the butter to the coconut mixture in a thin, steady stream and process for 2 minutes or until well combined. Increase the oven temperature to 180°C (350°F). Spoon the coconut mixture into the pastry case and spread evenly. Place the nectarine and extra sugar in a medium bowl and toss to combine. 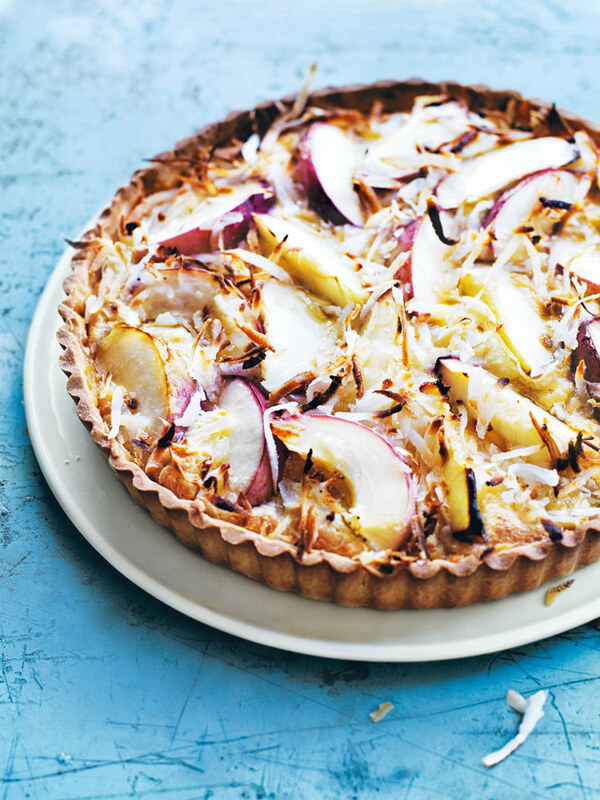 Arrange the nectarine over the tart filling, sprinkle with the fresh coconut and bake for 35–40 minutes or until golden and cooked through.